Japan on Friday became the fourth country to test-fly its own stealth jet, creating momentum to upgrade a lackluster domestic aerospace industry at a time when China continues to agitate in the region. 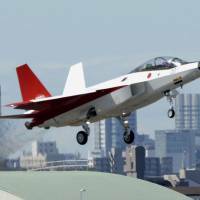 According to the Defense Ministry, the Advanced Technology Demonstrator, called X2, took off from Nagoya airport in Aichi Prefecture at 8:47 a.m. Friday morning. The demonstrator, which will undergo a further two years of testing before a decision is made on whether to develop a homegrown next-generation stealth fighter, flew about 15 kilometers and touched down at the Air Self-Defense Force’s Gifu Air Field at 9:13 a.m.
During World War II, Japan’s aerospace industry led the global competition with its Zero fighter. But since the end of the war, the nation’s technology has lagged behind and it has instead been buying fighter jets from the United States, such as the fifth-generation F-35 Lightning II. Yet Japan started the ¥39 billion demonstrator project in 2009 to preserve its withering aerospace industry, aiming both to keep up with latest defense capabilities and, ultimately, sell Japanese arms overseas. As a result, the X2 engines are made by IHI Corp. and its fuselage is developed by Mitsubishi Heavy Industries. The demonstrator is also equipped with locally developed stealth technology, including material designed to deflect radar and minimize the so-called radar cross-section of detectability. The demonstrator has been put through extensive testing since February, but its maiden flight was delayed due to technical problems. The Acquisition, Technology and Logistics Agency, which was spun off the Defense Ministry last year, said Mitsubishi Heavy Industries will deliver the demonstrator after May, following one more test flight and further ground testing. Tokyo is expected to decide whether or not to develop a homegrown stealth fighter jet, jointly develop it with other countries or buy from the United States by 2018. Yet experts say the domestic option could prove more expensive than buying the F-35. The introduction of the prototype also comes at a time when competition in developing superior stealth fighters has intensified. China’s Chengdu J-10, which has some stealth capability, is already in service and Beijing is likely to introduce the fifth-generation fighter jet Chengdu J-20 in a few years. “(Japan’s) national pride is at stake: China and South Korea are both working on fifth-generation fighters; Japan cannot be seen as being left behind,” said Richard Bitzinger, Senior Fellow and Coordinator of the Military Transformations Program at the S. Rajaratnam School of International Studies in Singapore. To Japan’s advantage is the 2014 easing of an arms export ban, which has given the nation’s defense industry momentum to develop arms with allies while keeping it abreast of the latest technology. Before then, Mitsubishi Heavy could only assemble U.S.-designed fighter jets under license, but had no access to the highly sophisticated technology used to operate them. Japan also could not take part in the global effort to develop the F-35 from its inception due to legal hurdles association with the arms ban. 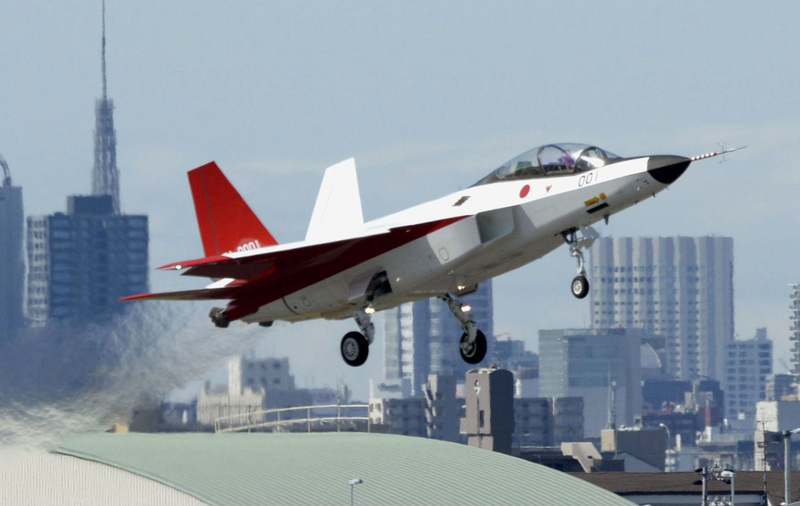 Hideaki Watanabe, head of the Acquisition, Technology and Logistics Agency, said that the technological advancement gained through the X2 “will give Japan bargaining power” for future joint development projects. Having superior jet fighters is also crucial to today’s air defense, particularly as China ramps up its maritime and aerial military capabilities in the East and South China seas. In 2013, China set up an Air Defense Identification Zone (ADIZ), covering the disputed Senkaku Islands, which it calls Diaoyu. It has consistently sent coast guard vessels and aircraft to the small isles, escalating tensions with Tokyo and the U.S., which has countered with freedom of navigation operations in the area. In February, Japan doubled the number of F-15 fighter jets deployed in Okinawa Prefecture to 40 in an additional response to the Chinese provocation.